A former Vice-President, Dr. Alex Ekwueme, on Wednesday, received the leader of the Indigenous People of Biafra, Nnamdi Kanu, at his Enugu residence. The IPOB leader described the former Vice-President as ‘invaluable’ to the pro-Biafran struggle. Addressing Ekwueme as ‘my father,’ Kanu promised to abide by any advice given to him by the elder statesman. He also explained that he came to seek the former Vice-President’s blessings. “So, I am humbled and delighted to be here and also to bring you up to speed as to what we have been doing, what motivated me, and what motivated the IPOB to do what we have been doing. “And for us to fulfill that very mandate, we must be diligent, we must be focused, and we must be sincere. So, I have come here to brief my father as to why we do what we do, and to get his blessings. 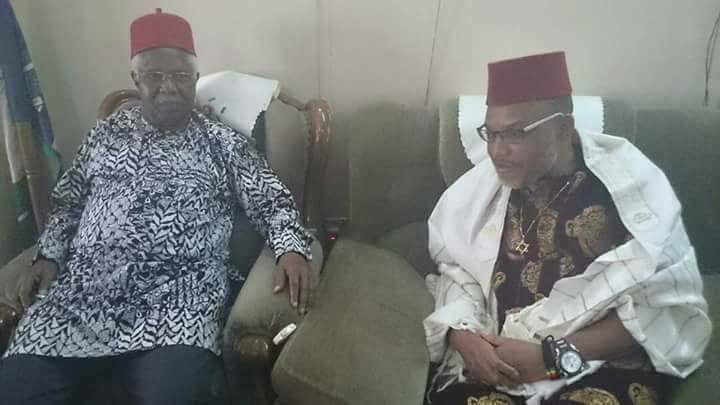 Responding, Ekwueme assured the IPOB leader that he would always give him the needed counsel. “I will make my best counsel available to him (Kanu) in his very onerous task of leading an organisation that is committed to bringing justice and equity among people, especially for our people,” Ekwueme said.